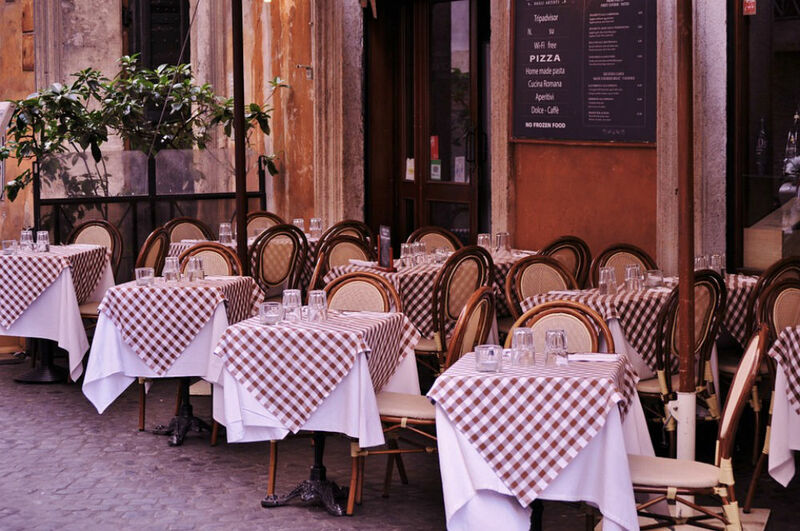 Could Your Restaurant Patio Be Boosting Your Revenue? If your cafe, bar or restaurant has an outside seating area, you’re probably just grateful for the extra space… but, is it working as hard as it could be? Simply adding a few chairs and tables to bump up the number of covers isn’t the most productive way to attract new guests and increase your income. Restaurant operators need to stop treating their patio or terrace like an afterthought. It’s time to transform it into a comfortable area for your guests to enjoy – and one that will give you a competitive edge over your competition. Here are four questions to ask yourself if you’re serious about maximizing the commercial opportunity offered by your outside space. #1. What’s the most practical purpose? Look at your business model. Assess the size and layout of what you already have. Is there something you’re missing, or could capitalize on more? Creating a cosy space that’s suited to alfresco dining in cold weather might be a great way to expand tight quarters. Or, perhaps you could introduce a drinking terrace to make more room for diners indoors? Would it be a helpful to build a children’s play area to keep kids entertained? What about using it as a function area for live music and events? The possibilities are only limited by the square-footage and your creativity. Take a look at these design tips and tricks to help you start thinking about your outdoor area in a new way. #2. How can you define the right ambience? Have a clear goal about the atmosphere you want to create in your outdoor space. Should it be playful, serene, or laid-back? If you can deliver a clear, consistent tone in your décor and amenities, it will help your guests have memorable experiences that will make them want to come back. Plants – minimal table pieces or overflowing planters? Real or fake? Lighting; fairy lights are cute (but not very bright), firepits are edgy but not safe for children, bright outdoor lighting is practical but not necessarily inviting. #3. Is it comfortable in all weathers? If you’re investing in upgrading your patio, make sure you can spin profits from it all year-round. If the weather in your area is notoriously unpredictable, a little bit of preparation is necessary. Shade and shelter are usually the most important consideration, both in warm weather to keep guests out of a hot sun, and during rainy seasons. You could also choose shade sails or awnings – bonus points for getting professionally branded ones like you can see here. Patio heaters and heat lamps are perfect for warming up tables beneath them – just make sure they’re safe to use with whatever canopy or parasols you choose. Lots of bars also offer fleecy blankets for guests to borrow when they go outside. Don’t forget about pest-prevention, too. Finding a way to keep birds and insects away from your guests will keep them much more comfortable (and stop them from running for cover)! #4. What are you going to do to promote your restaurant’s upgraded patio? The final step is to get people through your doors to enjoy your new outdoor space. You won’t be making any profits if guests don’t know it’s there! Terraces to the front of a property will always benefit from being seen from the road outside, but you’ll need to shout a little louder to get a rear patio or roof garden noticed. Start by bumping up your social media marketing – platforms like Facebook, Twitter and Instagram are perfect for showcasing the inside and outside of your cafe or restaurant in pictures. In warm weather, snap sunny photos of guests enjoying cool refreshments, then advertised sheltered, heated seating when the temperature drops. Don’t forget to promote new menu items, upcoming events and special offers. Don’t underestimate the power of simple signage, either. Existing customers might not know about outdoor seating if it’s hidden through a hallway or up a flight of stairs. Advertise your outdoor space with appropriate signage at the front of your premises and include directions inside. In today’s restaurant news: how to connect with social media influencers to boost sports bar traffic, why restaurant design trends don’t always mean full renovations, a NYC law bans hair discrimination, and more! Is your restaurant’s patio or outdoor seating area working as hard as it could be? Here are tips for maximizing and marketing your restaurant or bar’s outdoor eating areas to boost profits and build an amazing guest experience. With tight profit margins, restaurants need to do everything they can to grab guests attention. An easy and affordable way is with outdoor restaurant signage. A restaurant’s design should tell a story and give personality to the business. Here are the top design trends in restaurant design in 2018, everything from trendy restaurant lighting, eco-friendly restaurant design, visible kitchen restaurants, and photo-friendly decor. In Today's restaurant news: Trillium Brewing gets Storrowed, an All-Avocado restaurant gets a financial boost, and is Roman-style pizza the next big thing? Your restaurant will eventually need an interior fitout or a redesign. As the owner of the restaurant, it is your responsibility to know when that time is. In today's restaurant-inspired news: Marketing ideas for September, how design can influence business in your restaurant, and a free new FDA application to help with food safety operations. The Daily Rail: Is Snapchat Advertising Worth it? In today's restaurant-inspired news: Not offering alcohol free beverages could result in loss of profit, how restuarnt design will affect your potential guests, and why you may not want to invest in Snapchat advertismens. In today's restaurant inspired news: We look at five ways to boost sales with music, a cool video on why cheese is so addicting, and why you should just stick to what you do best. You use music to pump yourself up for a workout or to set the mood during date night. Why not do the same for your restaurant? Studies show music can improve sales and improve customer satisfaction. Do you have the right soundtrack? Newer PostThe Daily Rail: Are Your Restaurant's Policies Hurting Your Guests?